As the school year comes to an end, I wanted to share one of my favorite activities: something I call, The Courtesy Contract. In my book for EyeOnEducation Publishing, due out in early 2011, called Tips for Tween teachers by Tweenteacher, I include advice about the importance of building community in a middle school classroom. In fact, it isn’t something you do once and then check it off your list. The fact is that building community is an ongoing process. Heck, even towards the end of the year I am working to fine tune and tweak their respect of each other, the classroom, of education, and ultimately, of themselves. And that’s the key. If you can find ways for students to be leaders, to surprise themselves in their own abilities, and to respect themselves, then your impact as a teacher will extend beyond your classroom and the year you’ve had with them. The Courtesy Contract is a very special activity I save for the end of the year. I have contracts from every kid for the last 9 years (when I came up with the idea), from Honors to At-Risk, from those aspiring to be surgeons, to those merely hoping to graduate high school, from those who want to be rock stars, to those who want to study rocks. But let me back up. In my classroom library sit two tomes, huge books of contracts that students, over 2000 students ranging in age from 11 years old to 18 years old, have contributed to. These pages represent contracts, promises that my students have made to try to be decent in their lives beyond my classroom. They vow to take the feeling they’ve had here, and remember what it felt like when they are tested in life. Of course, I model my own courtesy contract before asking them to write their own. 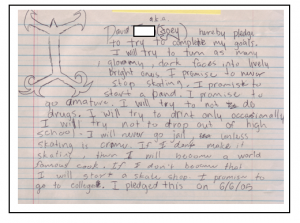 And by modeling my own, and by showing them the buy-in from all of the other students over the years, they always write the best damn pledge of their tween lives. I, Heather Wolpert-Gawron, do hereby vow to be the best teacher, wife, and mother I can be. I pledge to continue my own education so that I can always teach my students in ways that help them, challenge them, and prepare them for their futures. I promise to TRY to be a wife that chooses her battles so that my husband and I don’t fight over silly things like who gets to choose the next Wii game. I promise to be my son’s first teacher. I pledge to challenge myself in life, for “a life lived in fear is a life half-lived.” But I also promise to never jump out of a plane again. I know I did it to challenge myself, but What was I thinking?! I can’t promise that every classroom lesson with be yippie-yahoo-fun, but I do vow to sharpen my teaching practice like a knight with a sword, year after year; and when the time comes that I don’t enjoy teaching, I will gracefully leave the classroom, waving my hand like a Homecoming Queen. I promise to push through the difficulties of life, reminding myself that everything’s temporary. But I also vow to try to linger in the good chapters of life, cherishing them so that I can remember them when times get rough. 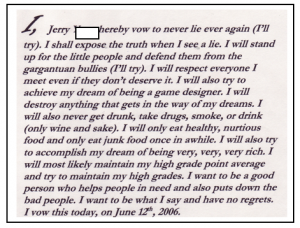 I pledge this on this day, May 30, 2010. ??????? ??? ?? - ??????? ??? ?? ??????????????????????????????????????????????????????????????????????????????????????????????????????????????????????????????????????????????????????????????????????????????????????????????????????????????????????????????????????????????????????? ?